Unless the magnitude of the dip is severe enough to breach the 2800 breakout level, there is no reason why the cup and handle upside breakout target of 2925-2960 should not be reached. 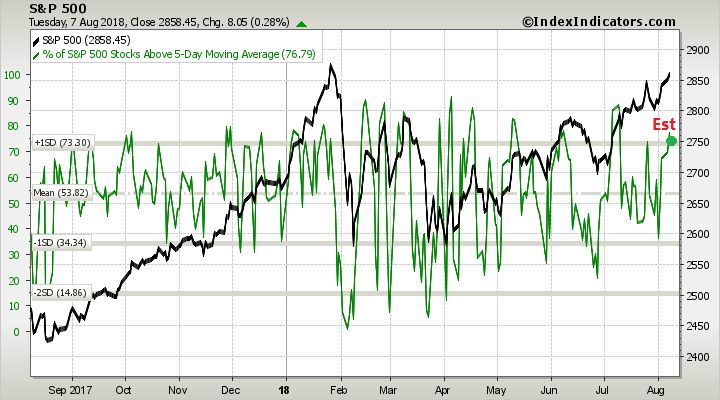 Market breadth, as measured by the Advance-Decline Line, is supportive of further price gains. And so is credit market risk appetite, as measured by the relative performance of high yield (junk) bonds. However, short term (1-2 day horizon) breadth indicators from Index Indicators have become overbought indicating a brief pause or pullback is in order. Subscribers received an email alert yesterday that my inner trader had stepped aside and moved into 100% cash. He is waiting for a dip and short-term breadth indicators to pull back to either a neutral or oversold reading in the next few days before re-entering his long positions. 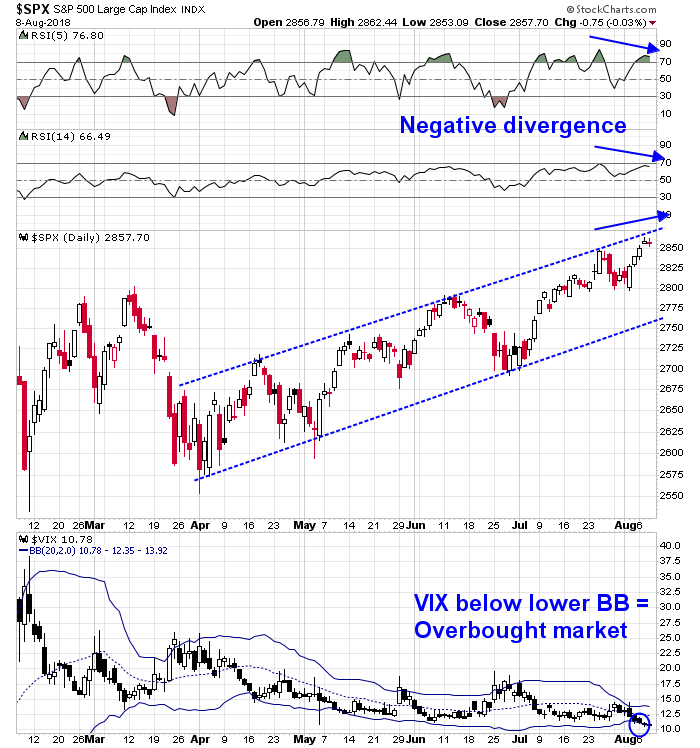 For more details, see historical analysis by Steve Deppe of what happens when VIX falls below its lower BB. S&P 500 returns flat to down but no major drawdowns. Fully agree. We are a bit extended to think about entering right now. But all time highs overhead, which should act as a magnet for now. Will be curious to see what the market does once it gets to the all time high. I would not venture a guess right now but wait & see what happens. Thanks for including this aspect about the vix breaching the bands. Had never seen this type of analysis elsewhere. Turkish Lira just blew up today. With it, the Euro also took a hit and the Dollar index broke past 95.xy and with it the ten yer treasury is rallying (Yen not so much). VIX is cracking higher. 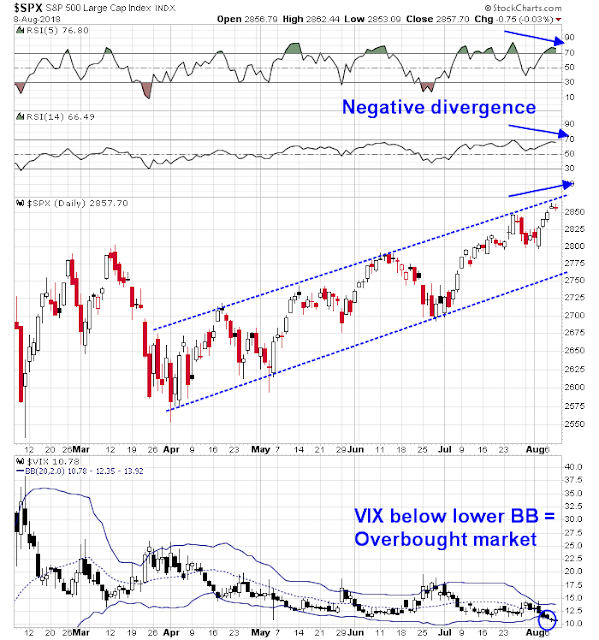 Let us see if a melt up in VIX creates a decent pull back in the stock markets like in February 2018, or not. There are significant shorts in the VIX that will get taken out as VIX cracks higher. Today is day 1 of the ambush. 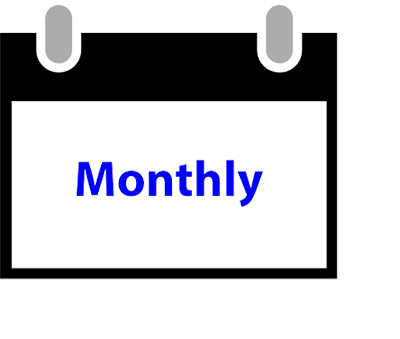 The February correction was short and deep (say ten days). Let us watch. Cam, I would appreciate what EMs to buy in the rubble. Thanks. Sorry, I wouldn’t know what EM you should focus on. The only thing I can contribute is central bankers (including the IMF) know what to do in these situations, and Turkey is small enough that the situation should stabilize. Will check out TUR. Your earlier calls on Mexico worked well, Canada, still in holding pattern. Just waiting to see if there is a currency crisis or significant loss in a particular EM (say -66%), for a trade. For now, not liking 10 year treasury contract (futures) still rallying; headline numbers not withstanding, treasury rally is not exactly comforting. Unfortunately, majority of these do not have $ hedged ETFs. As the Dollar index strengthens towards 100 (perhaps), one may need to have even bigger losses (approaching 80%, in US $ terms), before getting adventurous. A very helpful post/summary — thanks Cam. The market has sold off the past couple of Fridays — this concerns me because one can see it as an indication that people do not want to hold long positions over the weekend (surely everyone remembers what happened on Monday, August 24, 2016) — that said, I also see the market moving higher, but clear bullish momentum and sentiment seems missing. 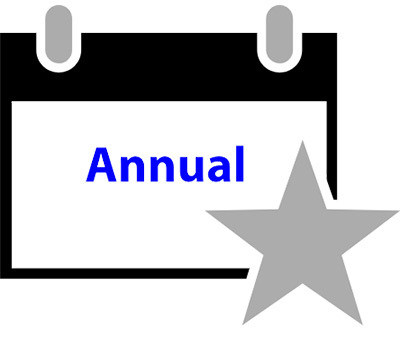 Sorry — that was 2015 — anyway, I certainly remember.